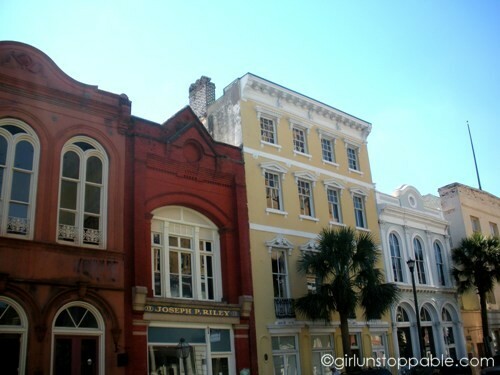 At times, Charleston was what I expected it to be. People moved slowly. There was heaps of Southern charm; people you’ve just met have a way of making you feel like they’ve known you your entire life. There was the church culture and beautiful colonial homes and the remnants of a segregated past that creeped into the present. It was apparent that the history has a much greater stake in the way things are there than it does in California where there’s much more of culture of focusing on what’s next. But in a few ways, Charleston surprised me and challenged my California notions about the Deep South. During my brief visit, I noticed that there was surprising amount of racial mixing happening. I came across restaurants that proudly displayed their dedication to all things local, organic, and sustainable. 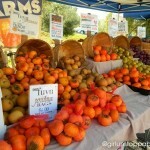 And slow food and a slow lifestyle in general in Charleston seemed to lack the pretense that often accompanies it in California. 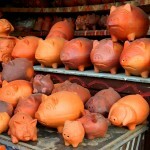 There, you get the impression that people are doing things in a certain way because that’s what they’ve always done. 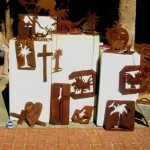 There were also the tidbits of the Gullah culture that I saw. Before that trip, I hadn’t been aware of the fact that there was a place in the United States where a decent amount of the West African culture had survived. I also wondered what kind of ghosts lurked underneath the surface; what I would find beneath those surprises and old school beauty and Southern hospitality. But what I experienced there was a beautiful extended weekend — gorgeous summer weather in the fall, a city that is quaintness personified, and of course, a really fun wedding. So I left with just a small taste of a new part of the country for me. I left more ready and willing to explore that part of the country, to try to understand it, to not write it off so quickly. 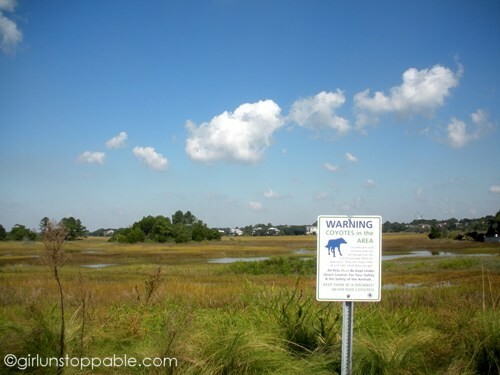 A marshy area with a warning about coyotes. 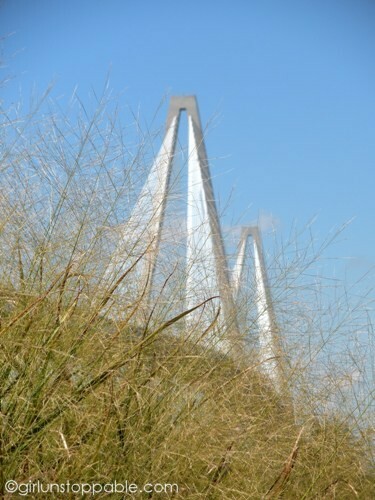 The Arthur Ravenel Jr. Bridge viewed through some wispy plants. 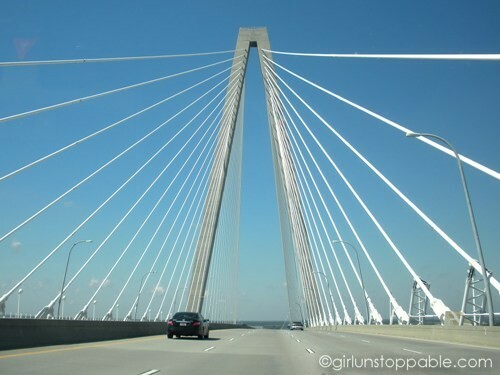 Driving across the Arthur Ravenel Jr. Bridge. 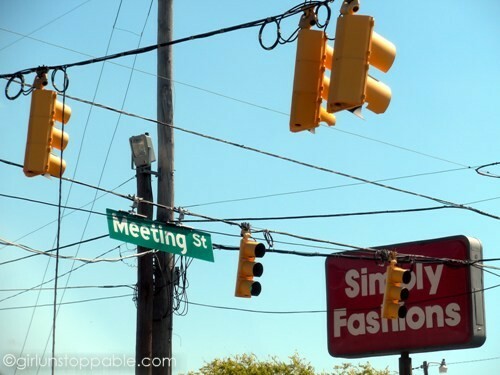 Signs and stoplights at an intersection on one of Charleston’s main thoroughfares. 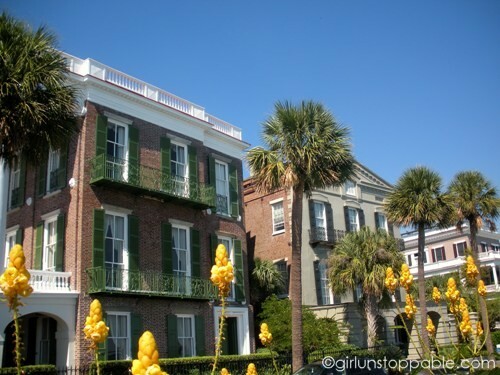 Colonial houses and yellow flowers near the Charleston Harbor. It was disturbing to see celebration of the Confederacy. 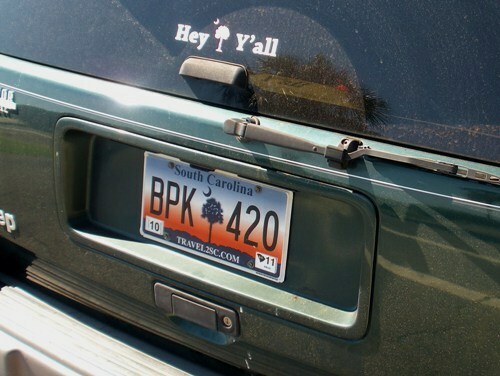 An SUV adorned with the classic South Carolina greeting. 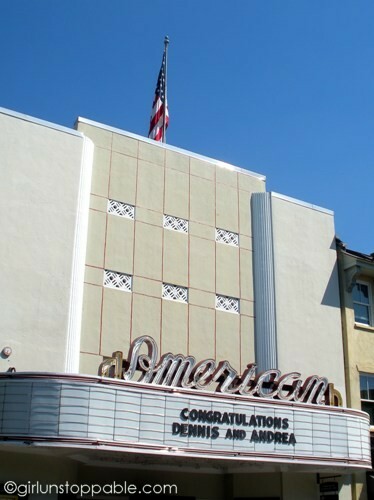 An art deco movie house that’s been restored and is now used for events. 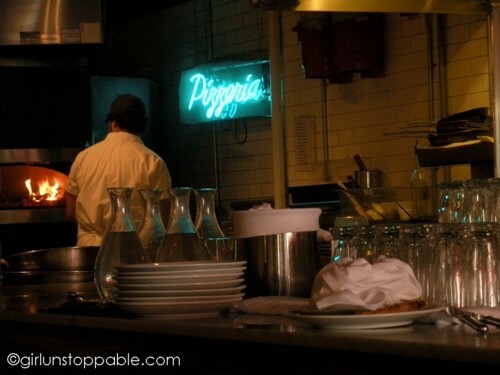 A chef mans the wood fired pizza oven at Monza restaurant. 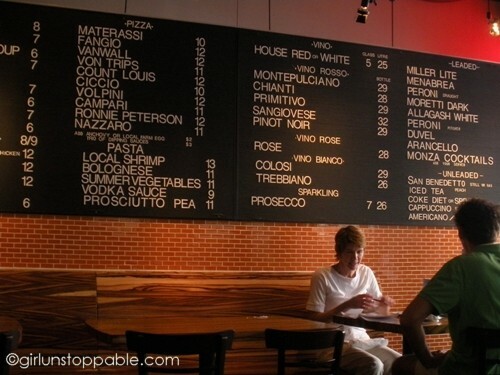 Restaurant patrons and the menu at Monza. 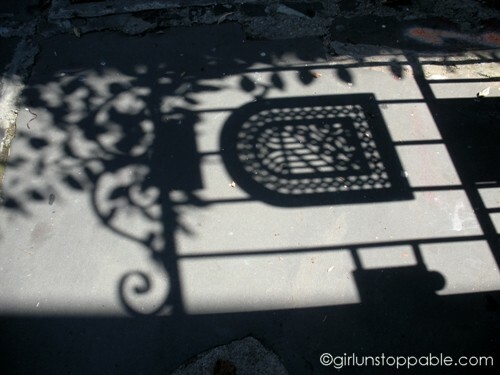 The shadow of an ornate gate. A row of buildings on Broad Street. Strange (creepy?) 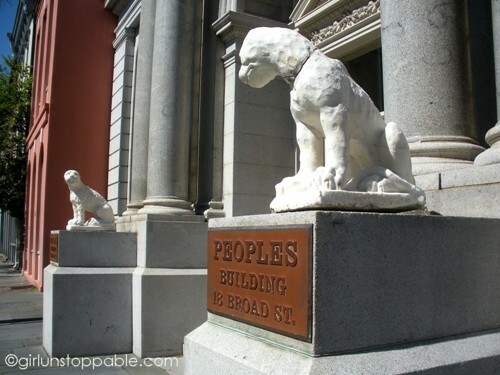 statues in front of a building that was once a bank but is now a condo complex. 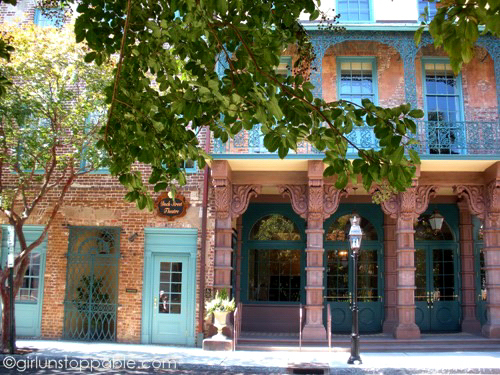 The historic Dock Street Theatre in Charleston’s French Quarter. 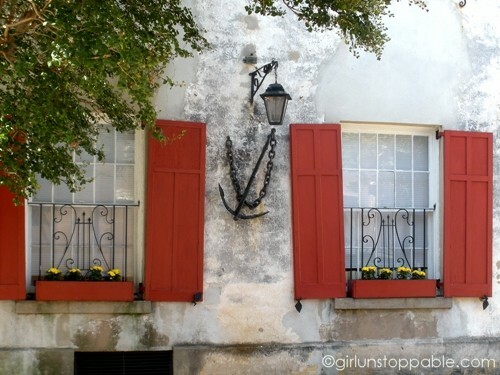 Red shutters, flower boxes, and an anchor decorate an aging house in the French Quarter. 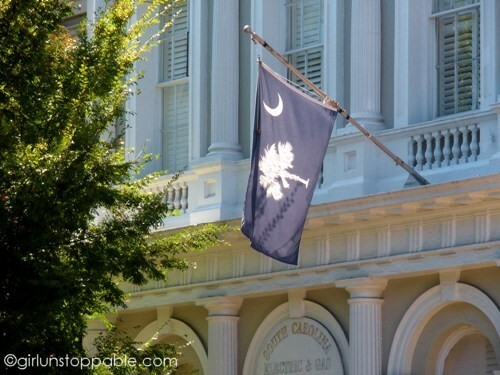 A South Carolina flag hangs in front of a South Carolina Electric and Gas Company building. 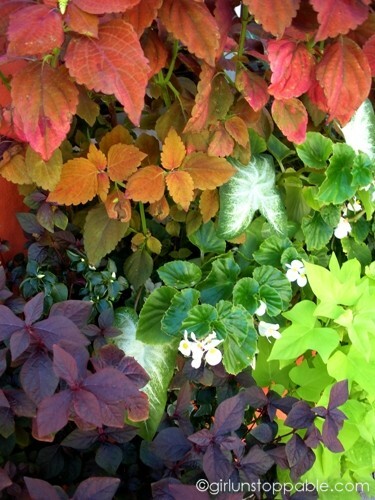 That foliage photo is stunning. Also, I love any menu that has prosecco, prosciutto and Miller Lite. As a Californian, confederate pride always weirds me out. I know they give you that it’s-not-just-about-slavery line, but I dunno… Can’t really get down with it. But Charleston was a surprisingly likable town. To me, Confederacy = bad… can’t see any gray area there. Even if you descended from Confederate soldiers or are a militant type, you’ve gotta be able to admit when things are just plain wrong. 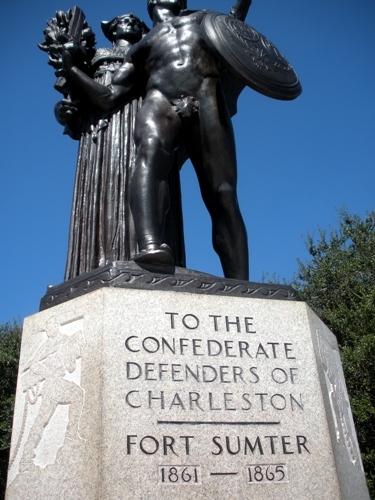 But aside from this monument, I didn’t see any overt Confederate pride and Charleston definitely was extremely likable. 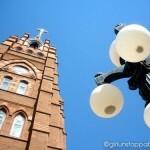 Looks like a really beautiful town and if I ever get to do my US road trip I think this should feature on it. 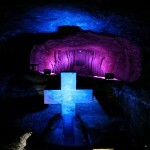 Love the colours in all the photos! The Confederacy was comprised of the Southern slave states in the 1860s. They wanted to secede from the rest of the states at that time (the Union) and uphold slavery. The conflict between these groups led to the American Civil War. That’s the gist of it in a nutshell. To me, celebrating the Confederacy is synonymous with celebrating slavery. Then later, the American South became a stronghold of segregation. Even after government institutionalized segregation ended, it traditionally has been a lot slower to move towards adopting more inclusive attitudes… hence my apprehension about this part of the country. But I will say that more often than not, I was pleasantly surprised with South Carolina and everyone I interacted with was extremely welcoming and friendly.